Goalkeeper: Kepa Arrizabalaga has proven to be a very solid signing for Chelsea since joining the club in the summer and the Spaniard is certain to keep his place between the sticks this weekend with Willy Caballero once again on the bench. 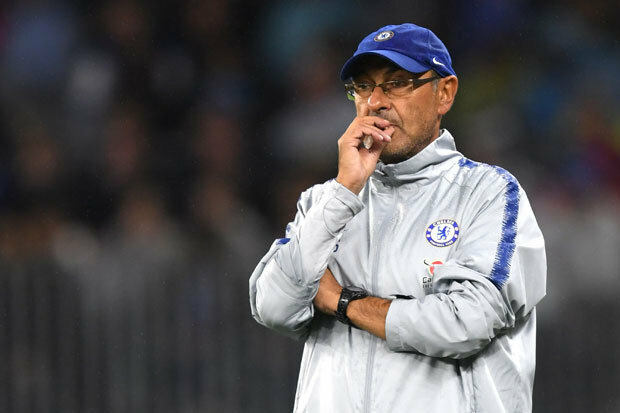 Defence: Sarri has played a settled back four in the majority of Premier League games so far this season so unless the Blues suffer a late injury ahead of the game, I expect we’ll see a familiar defence on show against United. Cesar Azpilicueta is expected to retain his place at right-back with the rejuvenated David Luiz lining-up alongside Antonio Rudiger once again in the middle of defence with the German international set to overcome a minor groin problem. That means Gary Cahill and Andreas Christensen will have to make do with places on the bench while Marcos Alonso should keep his place at left-back ahead of Emerson. Midfield: Jorginho has been the heart-beat of Chelsea’s midfield since arriving from Napoli in the summer and the Italian international is certain to start once again in the middle of the park on Saturday afternoon. New Customers can get Chelsea at an enhanced 30/1 to beat Man Utd. Max Stake £1. Winnings paid in free bets. Full T&Cs Apply. 18+|Gamble Aware. N’Golo Kante is also expected to keep his place after returning from international duty with France unscathed but we could see one change from the starting eleven that beat Southampton last time out. Ross Barkley has been impressing for club and country in recent games but the midfielder may find himself back on the bench against United with Mateo Kovacic recalled alongside Kante and Jorginho. Ruben Loftus-Cheek and Cesc Fabregas will therefore be vying for places on the bench. Attack: Eden Hazard was in superb form before the international break and Sarri will be hoping he picks up where he left off as the Belgian star will be key if Chelsea are to get three points against Jose Mourinho’s side this weekend. Willian is expected to keep his place ahead of Pedro in attack while Olivier Giroud should once again lead the line up front despite struggling to find the back of the net this season. Alvaro Morata came off the bench to score against Southampton last time out but Giroud brings the best out of Hazard so I think Sarri will stick with the Frenchman up front. Tomorrow Chelsea will win 3:1 against Manchester united.